This day we walked along the rim near the hotels and visited those and other historic buildings there. This is the train station. The Grand Canyon Railway does a scenic tour from Williams to here. My RV friend Anita just took that ride and we happened to be here the same day, but never saw each other. Just up the hill from the train station is the El Tovar Hotel, built in 1905. Among its famous guests were Teddy Roosevelt and Albert Einstein. Verkamp's opened in 1906 as a gift shop. 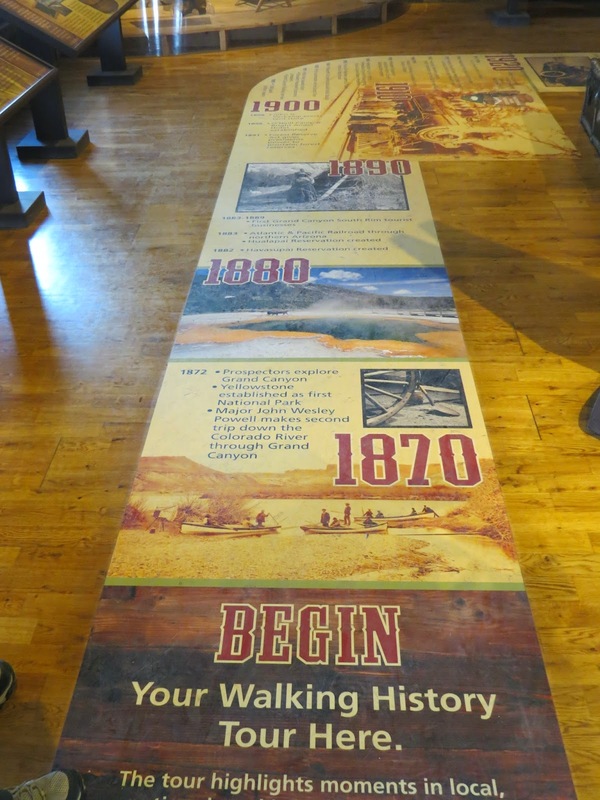 Today the Visitor Center focuses on pioneer history of the Grand Canyon and Village. You walk the timeline displayed on the floor. Edge sitting has been around since the beginning. From 1933 to 1942, the CCC built village roads, laid utility lines, and constructed backcountry trails. We can thank them for the nice wide trails we have into the canyon today. Of course we had to check out the view near the hotels and visitor center. In front of the El Tovar Hotel. This is as close as Birdie got to "standing on the edge." Hopi House is a retail outpost and gallery for high-quality Native American crafts. The building is another design by architect Mary Colter and built in 1905. Interesting display of basket weaving. Very creative, beautiful, and expensive "stuff" that I don't need in my RV. Lookout Studio was constructed in 1914, and also designed by Mary Colter. It sits on the Rim above Bright Angel Trail, and is said to be a good vantage point for viewing Condors, but not while we were there. Built by the Fred Harvey Company to compete with Kolb Studio, Lookout Studio originally offered telescopic views, photographs, and books about the canyon. The views are still there, and a gift shop is inside today. Next we visited Kolb Studio, originally built in 1904. It was the studio of Grand Canyon photographers, adventurers, and brothers, Ellsworth and Emory Kolb. It was also built on the edge near the Bright Angel Trailhead. As it first looked, before additions. An auditorium was added, among other rooms. A film they recorded of their journey through the Canyon on the Colorado River was shown in the auditorium. The auditorium with movie screen. Today the auditorium is part, museum, art gallery, and exhibit. Part of the Grand Canyon's permanent art collection is here. A "portable" canvas boat the Kolb brothers built for their filming adventure on the Colorado River. They would have loved the lightweight Hornbeck boats, like my kayoo. But the canvas boat was lighter than the wooden boats. Teddy Roosevelt on the Bright Angel Trail. The baby is Edith Kolb who grew up in the Kolb house on the edge of the canyon. I forget which brother was her father. 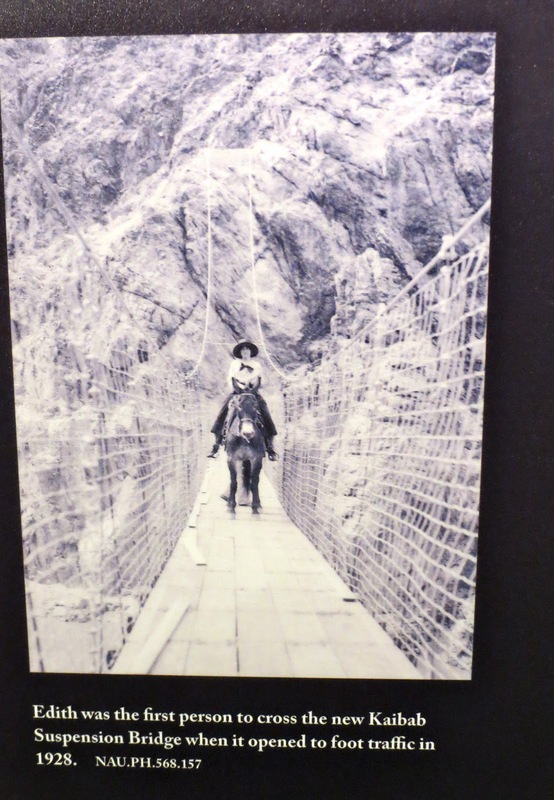 Edith was the first person to cross the new Kaibab Suspension Bridge. The trail leading from the Kolb Studio links with the Bright Angel Trail near the Trailhead. It may have been the original Trailhead. You have to be careful when you stop for a snack. Sharing with the critters is not allowed. Would somebody please tell the squirrels that? This rim-side cabin was built by and the residence of William Buckey O'Neill from 1891-1897. He went on to join Roosevelt's Rough Riders. 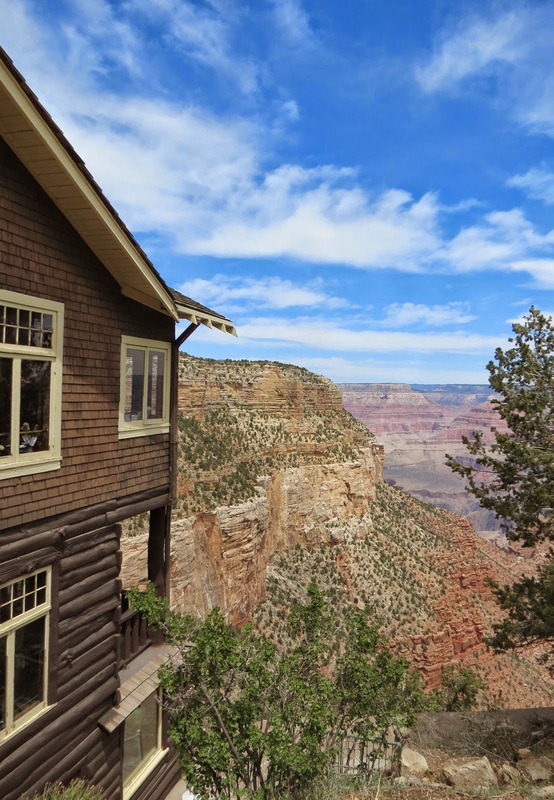 It is the oldest continuously standing structure at the South Rim, and is now part of Bright Angel Lodge. So next we checked out the Bright Angel Lodge. 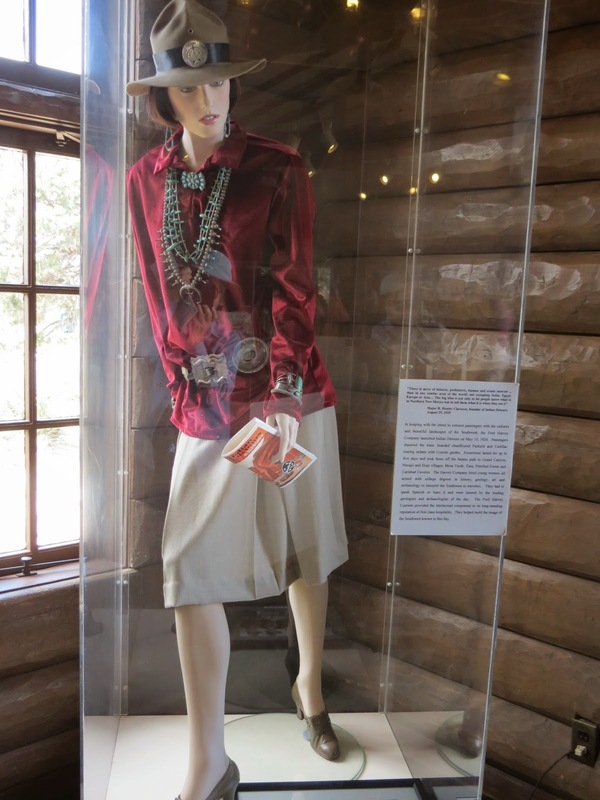 The Bright Angel History Room highlights the legacy of Fred Harvey, Mary Jane Colter, and the Santa Fe Railway at Grand Canyon National Park. This carriage was used to transport guests on tours of the Canyon. 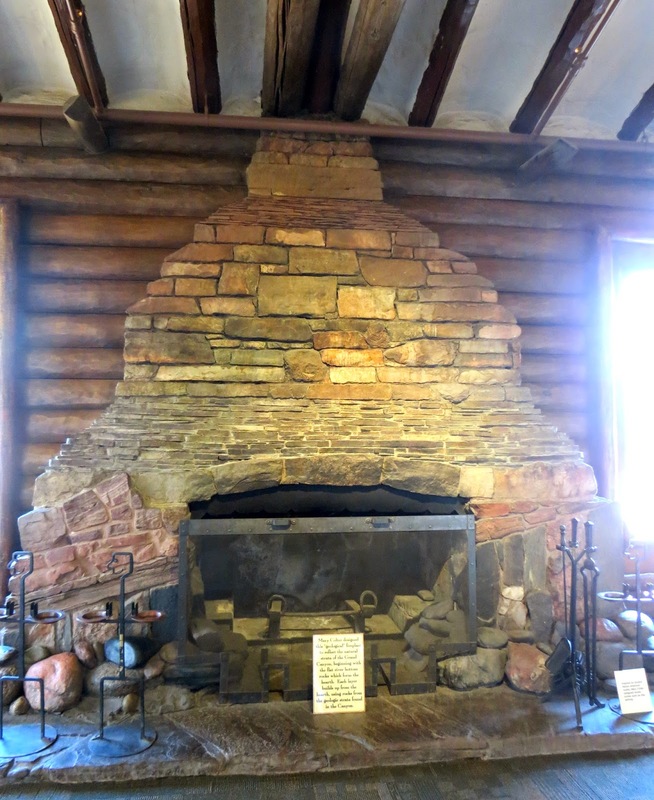 The Lodge is another design by Mary Colter with a special fireplace in this room. Inspired by Native American motif, she even designed the accessories, like these ashtrays. The Fred Harvey Company hired young, college-educated women to conduct tours of the area. The company also hired thousands of of women to work in his restaurants across the Southwest...waitresses known as the Harvey Girls. 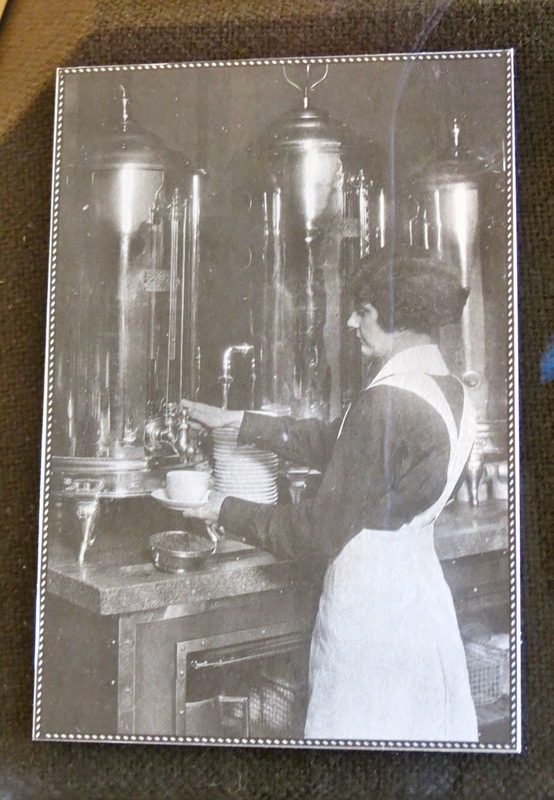 A Harvey Girl at work. They all wore identical uniforms. MGM made a movie about them, starring Judy Garland. So who was Fred Harvey? We encountered some of these people again when we visited The Shrine of the Ages and the Pioneer Cemetery. 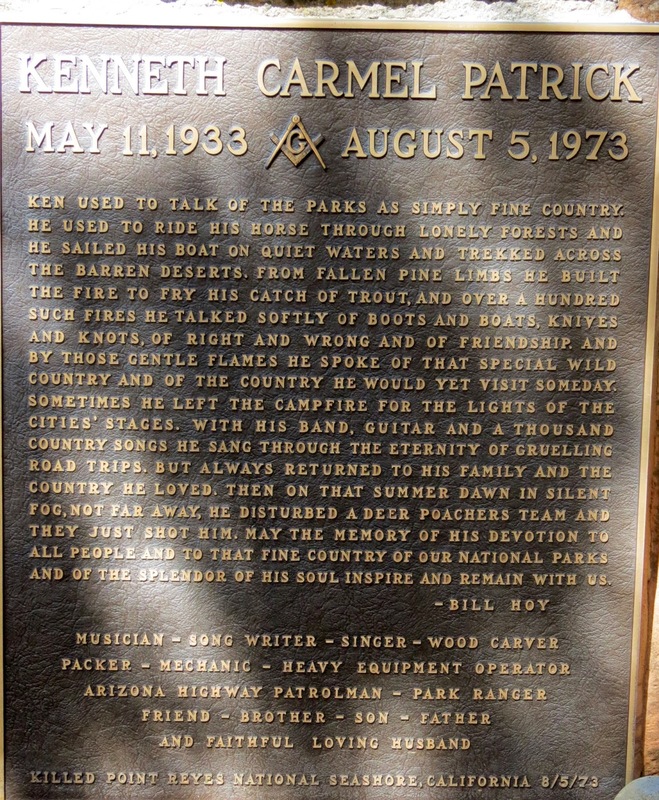 Many former residents and employees at the Grand Canyon are buried here, and the stories printed on their graves are interesting. I guess Emery Kolb was Edith's father. Many former Park Rangers are buried here. This is the mass grave of unidentified victims of the plane crash over Desert View. The names are known, but bodies couldn't be identified. Some stones have their whole life history like this husband and wife, Millard and Margaret Wilcox. And then there are the Harvey Girls. It was an interesting history lesson for me.